After blogging about it for a few weeks now, this past weekend I finally ran the Renegade Racing Santa Run. While this wasn’t a race to get a PR time, I definitely got a PR in FUN. And just for the record, running with antlers makes any race 10x more fun, even if the antlers kept falling off because of the wind. As for the actual race itself, it was great seeing people dress up and get into the holiday spirit. My only complaint about the race would be that the 5K and 10K racers start at the same time and are running together until about 1.5 miles in so it got pretty congested at the beginning. I think it would’ve been better to have the 10K group start a bit ahead of the 5K group so people weren’t trampling all over each other. The course itself is a basic out and back through some paved/dirt trails in Irvine with a few small inclines scattered throughout. There were some points on the trail that it felt a bit congested, but it thinned out pretty quick. 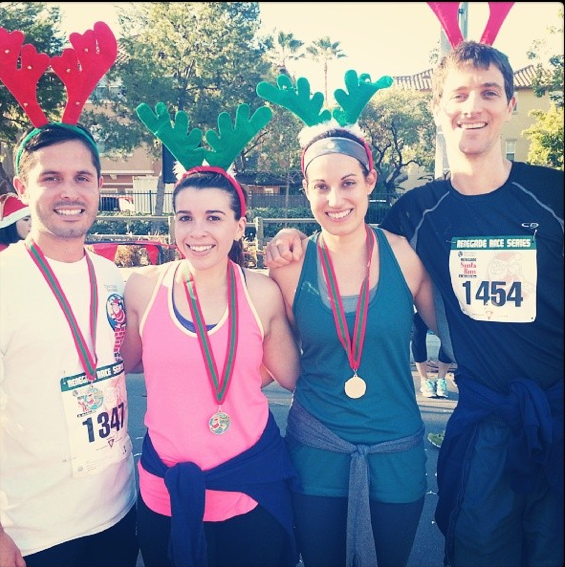 Overall this is a great race to run with friends and to help you get into the holiday spirit! 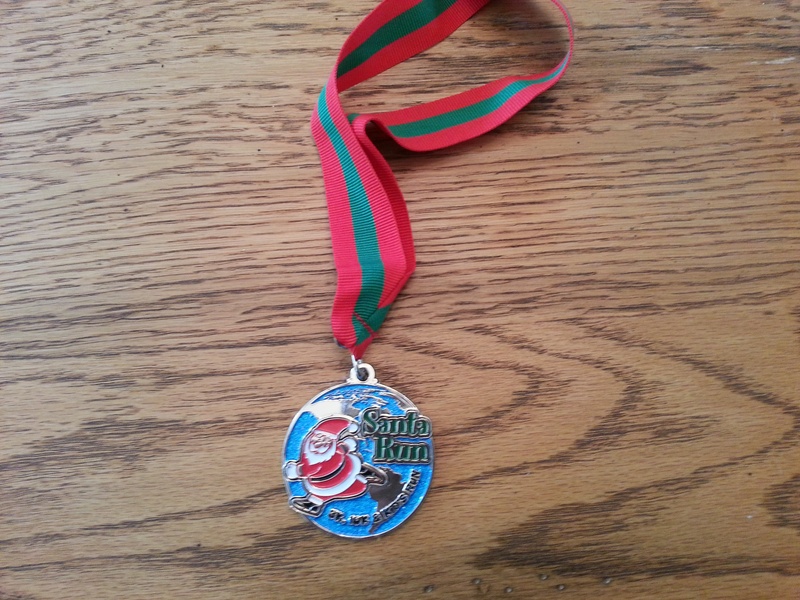 Every finisher got a Renegade Racing Santa Run medal too which I thought was awesome. Even though my 10K training is done (for the moment), I’m going to keep posting running/race recaps as well as training updates as I figure out my next race. I need a new goal race for 2014. Any suggestions? This entry was posted in Uncategorized and tagged holiday, racing, running on December 18, 2013 by allie@sweetpotatobites. Yes! Let’s find a 10K this spring and we can run for time.